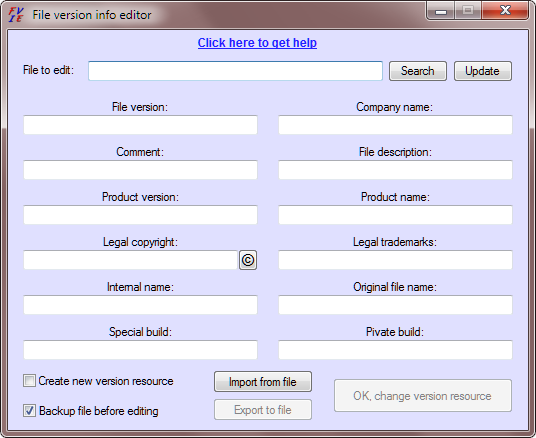 File version info editor allows you to edit the version resource info of binary files. Supported files are: Executable files (.exe), Dynamic link libraries (.dll) and drivers (.sys). Important: This tool doesn't work for files compiled with UPX. So, always leave the Backup file before editing box checked to be able to recover the file in case something goes wrong. Use the dialog boxes of your browser to save the file and open it when the download finishes. FVIE requires administrator rights to be able to edit files in some special directories like Program Files. When you launch FVIE, you will note that the Export to file and OK, change version resource buttons are grayed by default. This is because no file is loaded. Click the Search button, browse to the file you want to edit and click Open. You can also drag and drop a file in the File to edit input box. If you click the Update button, the information already contained on the file version resource of the file will be loaded to corresponding fields. The Export to file button is now active. Edit the fields to the values you want. To insert the copyright character on the Legal copyright field, just click the © button to the right of the field. After filling all the desired fields, you may be interested in saving the information to a ini file so you won't have to write everything again. Click the Export to file button and choose the path and name of the ini file that will hold the data. Later you'll be able to import this data from the ini file by clicking the Import from file button. The information in the ini file will be automatically loaded to the corresponding fields. Choose if you want to backup the file before editing (recommended) and whether you want to create a new version resource or edit the existing one by checking or unchecking corresponding boxes. It's highly recommended to backup the files before editing them. Some files may become unusable after the edition, specially the files compiled using UPX. The backup will only be done once. If a file has already been backed up, no second backup will be created. This allows you to always have the original file saved. When ready, click OK, change version resource. If FVIE succeeds changing the version resource, a message box will popup like the picture to the right. If not, the fields that FVIE didn't manage to update will be marked with red labels. If FVIE fails, and the Create new version resource box was unchecked, then maybe the file didn't have a version resource yet. 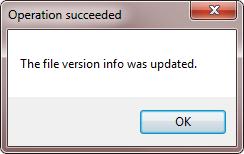 A message box will popup telling you to check Create new version resource and try again. 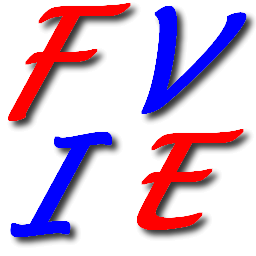 If you do it and FVIE fails again, then the file can be in use (a running executable file or a loaded dll). Make sure that the file is not in use and try again. If the file is not in use, and FVIE fails again, then it probably has some sort of protection against editing the version resource. Automatic detection of empty/unexisting version resource (automatically checks Create new version resource). Increased the window's width by 20 px. Implemented DPI awareness for the font of the controls.